So I know I just waxed philosophic (idiotic?) about my distaste for consumerism and how I think the rampant coveting-of-thy-neighbor’s-proverbial-iPod is ruining our culture and blah blah blah, and another anti-consumerist-type rant seems too much, right? Tough noogies. My blog. This story may have flown well under the radar this weekend, but I think it may be the most interesting one of the bunch. * Turns out Afghan farmers can make more money ($2000 an acre more, to be exact) growing pomegranates than poppies. In other words, Pom and its ilk have outpaced heroin as the most marked-up overblown new-thing-ya-gotta-have on the street. By a lot. Really a lot. 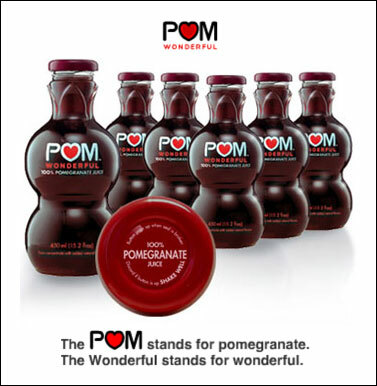 At 26 cents per fluid ounce, POM is 3 to 4 times more expensive than national orange juice brands…POM’s tagline, DRINK TO YOUR HEART’S CONTENT, works on two levels: It reinforces the health benefits of the juice and plays off of an emotional idiom. In short, it’s good for you, AND more lucrative than heroin. What a cash cow! *I must admit that I’m also interested in this because of my locale. Pomegranates are in no small supply here in Spain (they named an enormous area after them–“granada” = “pomegranate” in Spanish). I just constantly marvel at how oppositely-motivated the Spaniards are to the Americans. As much as they talk about needing to market and branding and what not, there is just more emphasis here on being happy in your life than being happy in your work. Like it or not, that’s why trends like these always pass them by. My husband teaches a lot of these branding specialists at a big company, and I can’t wait till he tells them about this. Oh, the forehead slapping that will ensue! And then they’ll go laugh about it over a 3-hour lunch.